You could put eukaryotic cells in a Petri dish and let it stir for a few billion years and still not create a better spokesperson for the aged, or the building industry in Ontario, than Hazel McCallion. For 36 years, she oversaw the incredible building spurt that propelled the once sleepy suburb of Mississauga into Canada’s sixth largest city. Along the way, she epitomized the self-propelled human dynamo, the ageless superhero who, as mayor, wore out staffers half her age. Now, at age 96, she has barely slowed a step, serving as “chief elder officer” of Revera Inc., owner/operator of over 500 retirement residences in Canada, the U.S. and the U.K., and chancellor of Sheridan College, one of Ontario’s top post-secondary institutions. McCallion’s philosophy is simple: “You can be old at 50 or young at 95.” Most of Ontario’s seniors agree, especially the recent wave of baby boomers. They don’t want to go gently into that good night, and that means embracing a new lifestyle, maybe an adult day care center in East Cobb or a condo with in house nursing. They’ve even created a whole new lexicon that rejects the R and C words (“retirement” and “care”) in favour of A and L (“active and “lifestyle”). Tony DiFruscio, president of St. Elizabeth Village (Zest Communities Inc.) in Hamilton, is putting this new active orthodoxy into practice. The 30-year-old, 114-acre site is pouring $800 million into re-imagining retirement living from all angles, both physically and psychologically. St. Elizabeth manages its renovation projects in-house and subcontracts the various stages, including a mid-rise building that will launch for marketing this spring. There’s a unique duality about the project that weaves the buzz of a theme park—like Universal Studios or Canada’s Wonderland—with the small-town feel of a village. There are 558 garden homes and plans to build an additional 1,200 mid-rise apartment condo-style units, plus a market square right on the campus. With more than 800 residents, these amenities, coupled with extensive programming (on- and off-site), makes its retirement units more boomer-friendly. 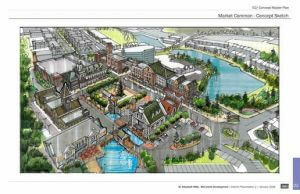 Toronto-based Forrec was hired to transform the site into a themed lifestyle complex. The chance to bring an amusement park designer to revamp a gated community came to DiFruscio after he took over the property in 2014. For builders, this new wave offers a unique challenge, and a tremendous business opportunity. Like many new retirement ‘communities,’ there is a choice between assisted or unassisted living. The gap between those at the low-end of the senior age group (the boomers) and the high end (the “silent generation,” the 80+ that grew up in the Depression) is wide. Both have a different set of wants and needs. What that means is that retirement amenities can run the gamut from fitness clubs and natural walking trails and on-site pub-style restaurants to 24-hour nursing care and personal assistance. While the Canadian Mortgage and Housing Corp. predicts Ontario’s red-hot real estate market will cool in 2017, the province’s aging population keeps heating up. For the first time in history, Canada’s 65+ crowd hit a significant milestone in July of 2015. Its numbers exceeded those of children 15 and under. Yes, nearly one in six Canadians—a record 5,780,900—are now aged 65 or higher. Those projections will continue to multiply and should hit 20.1% by 2024. The growth rate of 3.5% is also four times higher than any other segment of the population. Recent estimates say the province’s senior population will double by 2030. FRAM Building Group, the Mississauga-based developer and builder responsible for the award-winning Port Credit Village community, completed its Northshore Condominium Residences in 2011. It features a 22-storey tower and a separate six-storey low-rise building that offer upscale senior living for empty-nesters. These FRAM projects have tons of street cred. That’s welcome news to many new seniors who have shucked their single-family homes to embrace condo living. In many cases, this shift from the sprawling suburbs to more vibrant downtowns is the best feature of the Northside project. There is easy access to the busy streets of Port Credit, plus a welcome closeness to public transit and GO train service. Frank Giannone, president of FRAM, said blending the best aspects of private living with public access is a nice card to play for builders and developers. The nearby Port Street Market is a lively interpretation of modern life. The piazza is a place to meet and greet, people-watch and experience open-air events. It’s why placemaking works in a well-established village and waterfront setting, where amenities are within easy walking distance. Laurie Johnston, CEO of Oakville-based Ontario Retirement Communities Association (ORCA) refers the new retirement home movement in the modern lingo—“aging in place.” During her career in the retirement home business, Johnston was instrumental in introducing private sector ideas and partnerships to public sector agencies. ORCA represents owners/operators of retirement communities and their service providers. It is now developing a province-wide Data Collective to benchmark the sector in Ontario. Information will soon detail market trends in the senior housing sector. Along those lines, Johnston foresees a new wave of buildings connected to universities, libraries, community centres and public transit. That’s why location is so important, she says. There’s no doubt there are challenges for architects, builders and owners. The dramatic rise in Alzheimer’s and dementia has triggered a need for more assisted living. But even that has spawned some creative solutions. In the Dutch town of Weesp, a project called De Hogeweyk Village (it sounds like something right out of a Harry Potter novel) serves people with dementia. It allows inhabitants to do daily grocery shopping and go to restaurants, bars and theatres. Residents can also roam through the community’s streets, parks and gardens with the maximum in privacy and safety. Those with early onset dementia require stimulation and a community-like environment. The Dutch village exemplifies a push away from the “institutional approach” to retirement accommodation, says Johnston. ORCA has invited Eloy Van Hal, the genius behind De Hogeweyk Village, to be a keynote speaker at its 2017 convention, dubbed “Together We Care,” at the Toronto Congress Centre (April 3-5). It’s the largest gathering of LTC and retirement home professionals in Canada. Projects like St. Elizabeth, Harmony Hill (Oshawa), Schlegel Villages (one of its residences is tied closely to the University of Waterloo campus in Kitchener) and Bramalea Retirement Residence in Brampton exemplify the broad range of projects now available to seniors. Harmony Hill and Bramalea are managed by Greenwood Retirement Communities. The Oshawa project is five blocks of condo units, including The Grove, catering to independent living, and The Orchard, a full-service living building. Bramalea is a converted Holiday Inn located in the middle of a giant shopping district. Robert Alonso, director of construction at Toronto’s Fieldgate Construction Management Limited, was project manager for the giant Harmony Hill development. It was built to offer a multitude of amenities and services under an open concept, including fireside lounge, dining room, library, computer lounge, bistro café, general store, heated indoor pool and fitness centre, beauty salon, spa, theatre-chapel room, games lounge, activity rooms, dance classes and art classes. There’s also the walkable outdoors and lovely vistas of nearby Lake Ontario. It also offers full assisted living. Thomas Wellner, CEO of Revera’s global senior living communities, sees a doubling of its Canadian units in the next five years. 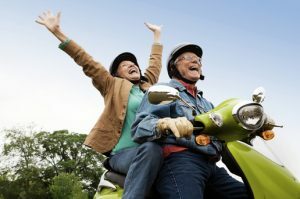 “I think there are opportunities for much more relevant offerings to meet the needs of seniors that are coming,” he said in an interview with Canadian Press. According to the CMHC, Quebec (16%) has the highest percentage of retirement housing in Canada—some of its housing takes up entire city blocks. Ontario checks in at about 5%, but its portfolio will continue to climb as the boomer wave continues to age. And this baby boom generation (born between 1946 and 1965) is a demographic tsunami with trillions in disposable income. It also carries with it a new, can-do-anything attitude about retirement. They want accommodation to reflect their “adventurous” view on life. The building industry appears eager to embrace communities with different housing options. The Friday Harbour resort at Big Bay Point in Innisfil is a $1.5-billion, 600-acre project on Lake Simcoe that will, when complete, offer up to 2,000 condos and hotel suites, an 18-hole championship golf course, 214 acres of forest of environmentally protected land, a full marina and about 40 new retail spaces. It’s the brainchild of Earl Rumm and Markham-based Geranium Homes, in partnership with ConDrain Group, Optus Capital and Pemberton Group. It took 13 years from concept to completion, and it caters to urbanites from age 30 right through to retirement. But there is no definitive composite drawing of a senior or retirement residence in Ontario these days. They range from St. Elizabeth or Harmony Hill, which cater to seniors and retirees, to a hybrid like Friday Harbour, a mixed-living resort that has added options for retirees. Schlegel Villages (headquartered in Kitchener) is one of Ontario’s biggest chains of LTC units and retirement homes. It is in the midst of expanding its retirement facility at The Village of Erin Meadows in the west end of Mississauga. A new 12-storey retirement home will add 277 suites to an existing LTC facility located just across the parking lot. The project is a shift away from a “care model” to a “social model of living,” explains Denis Zafirovski, named the interim general manager of the village last year. Schlegel has followed the blueprint at another of its LTC facilities in Windsor. These new housing options are very different from the post-war era, when suburbanites needed to be located near schools. Today a proximity to public transit and busy urban locales are the gold standard, and help eliminate the need—and the expense—of a car. ORCA foresees a seniors’ population that will double to 10 million over the next 21 years. By 2036, one-quarter of Canada’s population is forecast to be 65 and older. Johnston calls this new wave of retirees “a slow-growing boom,” and many won’t hit the doorsteps of retirement homes for another 10 to 15 years. 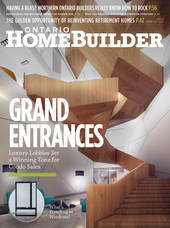 McCallion says the elderly can still be social contributors, and how they embrace the challenges of aging is “an important factor in one’s outlook on life.” That’s also true for Ontario’s builders and developers. They can help grey-power advocates rewrite our preconceived notions about the aged—especially where they live, and how they want to live.